Too many people suffer nowadays from too many things, many of which should decrease (or not even appear in the first place) with a change of diet. The longer we go on eating the foods we do, without much care about what we're eating, the worse our health is going to get. We all know we should be eating fresh fruit and vegtables, and more importantly, preparing them ourselves (no frying! ), yet often it takes a visit to the doctor to actually start eating healthily. 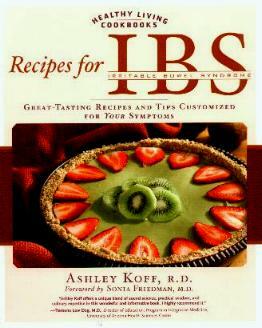 IBS is not always easy to diagnose and you'll learn much about this bugaboo from Dr. Friedman's foreword. By all accounts it's much cheaper to eat and exercise correctly than pay for the drugs which may or may not even work. Author of this book, Ashley Koff, is a registered dietician and she gives us alternatives to choose to help alleviate the symptoms that may be bothering you. Her recipes are color-coded: e.g. Red - helps with loose stools and diarrhea; Orange - helps with indigestion, flatulence, bloating, cramps, etc. So you can custom-make your meals to suite your particular affliction. Recipes include: Hot Vegetable Pie; Lime Fish Kebabs; Stir-fried Scallops and Sweet Potatoes; Ice Berry Sangri-Tea; Banana Pudding, and there are also very helpful Sample Menus - what could be easier! And delicious! She also suggests laughter, massage, physical activity, relaxing, sleep, and more, to help with IBS. IBS is, according to Dr. Sonia Friedman, who wrote the foreword; "Chronic or recurrent lower abdominal pain or discomfort, altered bowel function, and bloating" among other symptoms. Nutritional guides are given. Visit Ms. Koff at the Healthxchange, her nutritional counseling and consulting company, www.thehealthxchange.com website. Conclusion - Extremely helpful in helping us become healthier.